Have you ever lived through the experience of a home remodel and wished you could be anywhere but there? Say hello to Destination Renovation Vacation! We’ll walk you through with steps to success. We've seen them! You've, no doubt, seen them too! Those cleaning hack internet articles that have you pulling out the mop and whatever method, remedy, additions to cleaners they are using to promote their own products - And, we say WAIT! What about my warranty!! 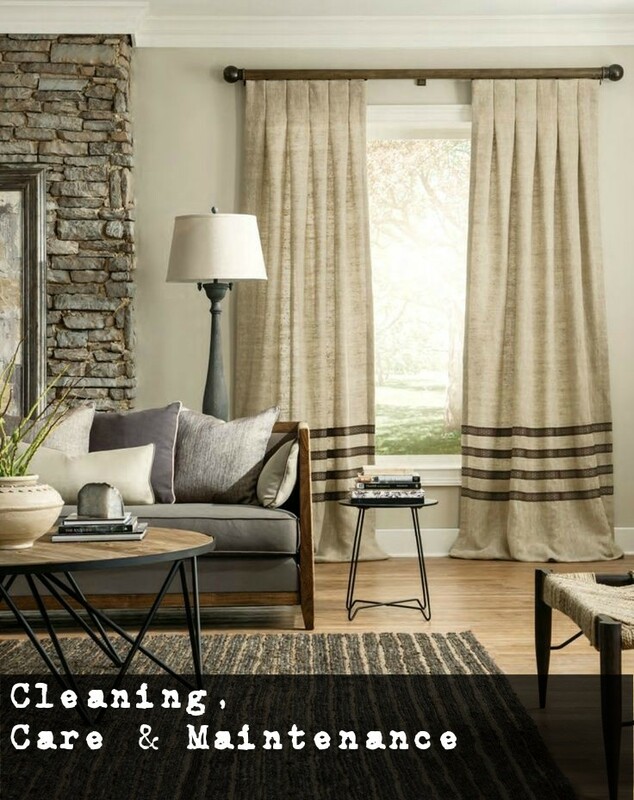 Before you try one of these "hacks", let's talk about the proper cleaning, care & maintenance of your own floors, rugs, draperies and window treatments. We'll get to some of this in our next Blog on care & cleaning. Today our focus is hard surface flooring with a reference guide that you'll save (yes, please) to keep your quality purchases up to their intended performance. What's got me going? A recent "hack" of adding essential oils, now before you judge I love essential oils! 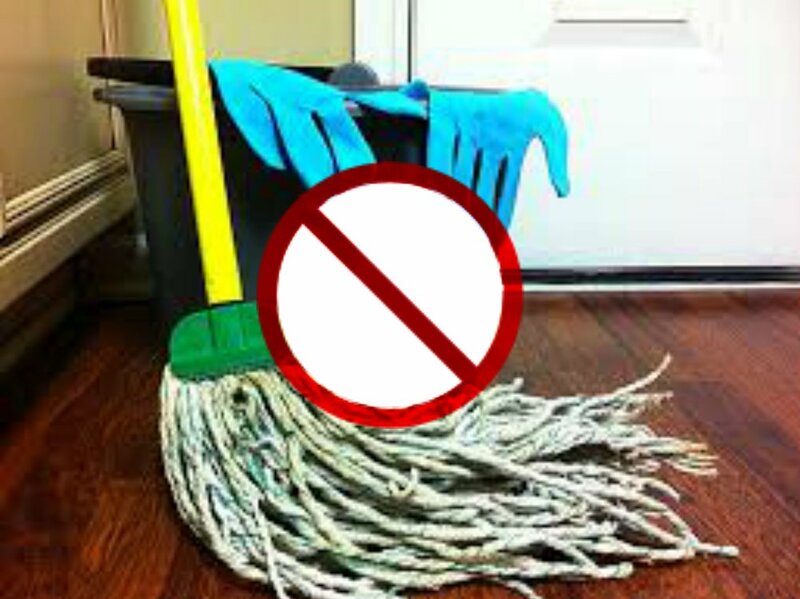 Just not in a mop bucket with water intended to scrub any wood floors, especially our beautiful hardwood floors. It's the easiest way to remove the natural luster of the hardwood and your warranty along with it. So, what is the best way to clean, care and maintain the beauty of Hardwood Flooring? All of our vendors agree, it is with a floor cleaner specifically made for your hardwood finishes. Water and Wood Don't Mix . . .
From Hardwood to Laminate Floors . . .
"But, my steam mop says I can." I was at a clients recently visiting the laminate floors we had installed and there she was, her housekeeper, steam mopping away on our beautiful new floors! True, many of the popular steam mop brands do list laminate floors right on the box as was pointed out to me, but don't you believe it. Manufacturer's warranties do not include "other people cleaning" in their warranty, which brings us to "Friends don't let friends steam mop". Then there's Vinyl Planking, with possibly the largest misconception for cleaning that we come across on a daily basis. Did you know that steam mopping a vinyl plank floor, even the newer waterproof vinyl planks, that steam mops have the potential to damage the floor? The steam results in dripping water that will seep between the planks loosening the glue that holds the planks in place and the heat from the mop will cause the vinyl to warp or bend. The entire process will also dull the finish. What is recommended? The "Laminate Floor Tips" video is a great start for your vinyl plank floors with these exceptions: It is okay to lightly damp mop vinyl, ahem...lightly, and a Neutral-PH balanced floor cleaner designed for vinyl floors is the go-to for restoring the luster. Do Use The Power Of Steam For . . .
With all of our "don'ts" we actually love saying "Do"! And, we put the steam mop back into action when it comes to tile. There are so many different types of tile to consider though, and I think this photo captures them all with natural stone and man-made tile as well. 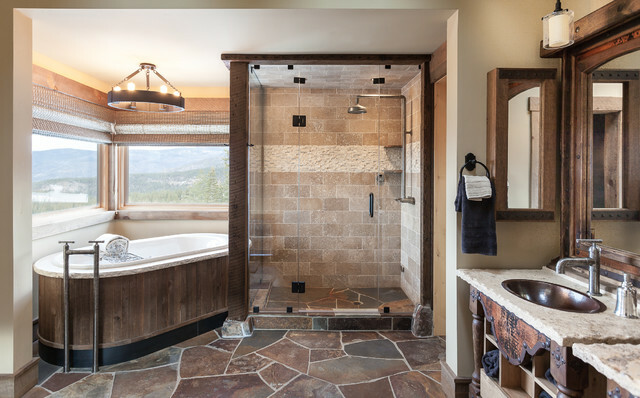 Avoiding harsh chemicals is the best rule to follow along with these tips on how to clean the shower that apply just as well to your floors. Click for more on cleaning tile. Thank you so much for joining in on this Blog post! We do have an attachment to our floors long after the sale is through. Preserving the quality of the floors through care, cleaning and maintenance is a great first step to loving your own floors for years to come. We hope you'll help us get the word out to the world-wide web by liking and sharing this blog post. If you do have any questions or comments, please leave them in the comment section, or give us a call at (805) 237-1400. Happy to be of service. Subscribe to our blog for part two in our cleaning series.... Coming soon! When we think of new flooring we are apt to tune-in to popular decor trends, beautifully showcased in design magazines. While our focus is on the beautiful, it's good to remember that these images are staged to draw our attention and may not offer the best solutions for your personal living space. At Knight's we focus on our client's lifestyle ensuring the selection you make is the one you'll love for years to come. Consider this: Gravity dictates that with every step you take in your home, you're stepping on your flooring. Whether in high-heels, cowboy boots, cozy slippers, or your barefeet, you deserve the comfort and quality suited to your needs. 1. How is the room used? 2. Heavy or light foot traffic? 3. Is this space the center of activity for my family? 4. How much direct sunlight is in the area/floors? 5. What flooring is best for my pets? 6. How can we create a smooth transition to other flooring surfaces? 7. How often do I change my decor, colors, theme? 8. Is this floor CARB certified? 9. What is the warranty coverage? Now make your own list and let's see how these questions apply to you. As a small, family-owned business it is of the utmost importance that we continue to provide quality where it counts. From the accountability of our manufacturers & vendors, to our own installation team and into your home - we've found these questions very useful in helping our clients make informed decisions and we hope you'll find them useful too. You have questions??? We have answers! As you can imagine, we're very excited for this year's event and thank you for checking in here. What makes our event a stand-out? Our MEET THE EXPERTS event is a personalized home show where you meet one-on-one with Factory Reps, Installers and Industry Pros to learn more about the product's quality and application for your home. April 16th - This just in! You'll want to scroll down to see all the offerings for our Raffle Drawing. Tom Garner began his career in flooring in 1977 as a carpet installer in Lansing, Michigan. In 1983 he relocated to Southern California where he installed carpet at first, but then quickly moved into retail carpet sales. 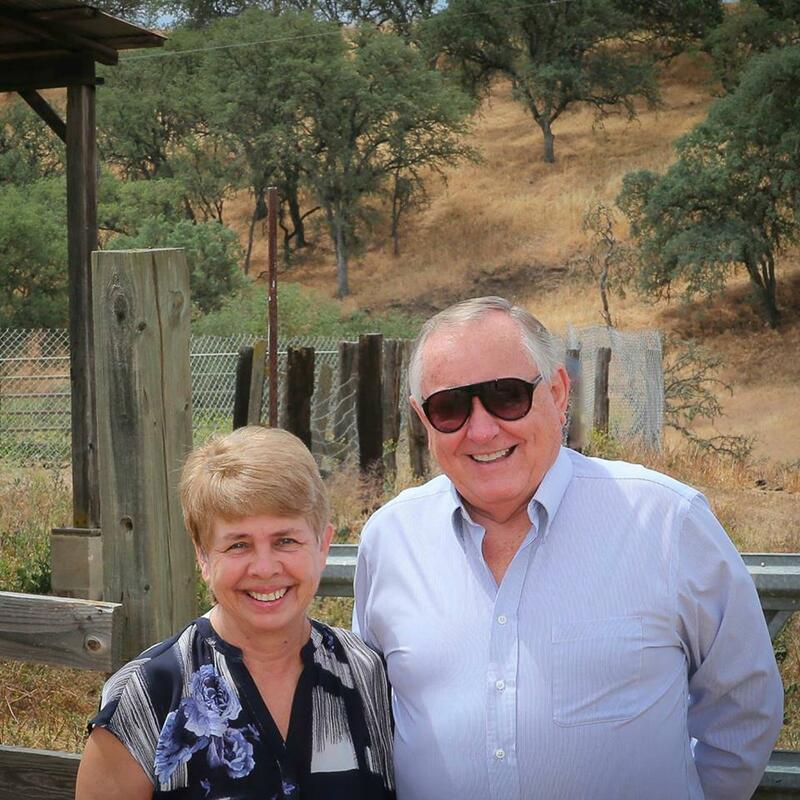 After eleven years of retail sales and management, Tom switched to working for a carpet mill and began his 22-year career with Tuftex. We're so happy that Tom will be our "Expert" for all your carpeting needs! Toni Huggins has been a player on the Hunter Douglas Sales team for a little over ten years and her energy is contagious! She absolutely enjoys working alongside her dealer partners (namely Knight's) and loves her 'dream territory'. Her expertise in Hunter Douglas Window Fashions is a definite Must Have for our event. Toni is very excited to meet with you, share design ideas, and talk about "putting a motor on it" with the new PowerView app. We had so much at last year's event, we're coming back to do it again! Of course, we're bringing along pizza stones for the raffle and great savings on the above featured products. Very excited to be a part of Knight's 25-year anniversary celebration! We've fallen in love with vinyl all over again, and you will too. Our Expert Ryan Burns will walk us through the amazing properties of vinyl planking. The Core in COREtec is what makes this a truly unique floor with cork constructed in the underlayment. Did we say "cork"? Yes, we did and Ryan will be bringing along some local corkage for our raffle drawing. Are you wondering which wood will work for your home or office? Scott Ashman's expertise in wood and laminate flooring is just the Expert advice we need to answer this question and more. Hardwood or Laminate? Custom Finishes? Pattern layout? Hardiness? We came up with a few questions for Scott, now the question is: What your's??? All American Laminates and Homerwood Hardwoods. What would a party be without goody bags? Along with our Experts we've all been very busy bringing together some fabulous prizes for our raffle drawing and filling up the goody bags for all attendees. This year's event is coming together with a ba-bang for our 25-year anniversary. Can't wait to see everyone. Had fun! Some great ideas in decorating. You guys went above and beyond! 'Twas the night before Christmas when all through the house . . .
Timeless updates that last well beyond the holiday decorating are the focus of "Holidays in the Well-Lived Home". Give yourself a gift while at the same time entertaining family and friends. Want to make a big impact? Paint the front door! We love this holiday color palette by Sherwin Williams. Your guests will delight in the color of a welcoming entry door and you'll enjoy your new look for years to come. Learn more about Sherwin Williams "Chip It" **Always, always, always paint a sample swatch before beginning any paint project. Computer palettes are deceiving. Don't forget the welcome mat! They make great gifts as well. We all have that one friend or neighbor that is always one step ahead in changing their decor with every season. We stand in utter awe of their planning, their skills in announcing a new holiday is coming! We love the effect and charm and secretly wonder: "How do they do it?" If you could choose one piece to carry through to every season, what would it be? Gift yourself a few "vessels" as shown here and simply transform your space throughout the year. The antique suitcase is a great vessel find! Of course, asking for that one thing and I ended up with two - no problem! Compliment your design scheme with table runners. Get out those fabric remnants or Gramma's lace doilies and highlight the Vessel Vignettes. Given a couple of hours I could pull this off! Love these Pinterest finds. I can't help but give a practical side note for your entryway: Bullit-proof your floors! Is it too late to add an accent wall? We don't think it's too late and an accent wall is the gift that keeps on giving. You'll smile every time you walk by. With York Wallcovering's new SureStrip papers you are assured of an easy on installation, and if you joined us at our Relocation Celebration you saw first-hand these papers are also easily removed. We're on a roll now and will carry our vessel creations throughout the home and use to coordinate our table centerpieces and trim the tree in our amazing color-scheme. Cue the tree trimming. . . I wish, oh how I wish, someone would have given me these tips years ago. Learning over the years time-saving techniques to filling my tree with decorations - key word "TIME SAVING". Give me spools of wider width wire-rimmed ribbons, decorated garland, floral picks and sprays and I'll decorate tree after tree, after tree, and love doing it. Once you have filled the tree with lights, or better yet start with a pre-lit tree, grab your decorated garland and from the top drape throughout the tree loosely, going around the tree horizontally. You'll be coming back for a tuck here and there. Now my favorite part the ribbon!! Again from the top and running vertically, about 9 feet of ribbon for every foot of the tree. Vis-a-vis, you'll need at least 6 - 9ft. spools for a six-foot tree. Now weave the ribbon in and out from top to bottom at equal points of length all around the tree. Fill in with your floral picks and sprays and a few ornaments that you used in your Vessel Vignettes and you'll be tree happy! Even as a decorator the task of creating the perfect holiday scene has me feeling a bit pressured. It's important to remember that there is no such thing as "perfect" and for that very reason give yourself, and your friends, another gift this season of cozy comfort. I'm ready to wrap myself in these faux furs from our friends at Fabricut, and possibly recover the ottoman too. They look so divine I would not hesitate to leave my furry throw out on the sofa and invite someone to join me with a cup of a rich, hot cocoa made just for us adults - insert wink. Of course, slippers we must have slippers in our "Well Lived Home". In my decorating travels over the years there are so many things I've learned from our clients. The ins and the outs of providing practical solutions for family living, all the while maintaining a well-appointed design. An interesting challenge that can and will become one for us in "The Well-Lived Home". -----> We've updated this blog to feature more bullet-proof floors. For those who are fortunate enough to have a mud-room and entry from the garage, the landing area for the clutter of a busy day is easy to hide. For the rest of us the landing area must become a feature in the design. The console table is an intricate piece to this theory and becomes the catch-all for keys, homework, shoes and more so choose well. Keeping the top of the console decorated will distract from the mess hidden within and detour family members from cluttering the top. Give them a flat surface within arm's reach and it'll easily be filled with the findings of the day. It's all about the drawers... Working closely with clients we've discovered dressers and sideboards make wonderful entryway tables. Living large, if you have the space we say go for it! As shown here in this entry hall a very family-oriented space with enough drawers for hiding you'll have to assign a row for each member of the household, pets too. When working with smaller spaces that don't offer an entryway, create one by placing the console table close to the door and incorporating into the living area. Designate the flow with an area rug. This small space is very charming and will easily adapt to any design theme. The consoles are picked and have been placed, but what about the floors? Our Favorite Entryway Floors for our Well-Lived Home are worry-free selections that can a take a beating and hold their beauty. When you want to carry real wood floors throughout your home a stunning compliment for the entryway is to create an area rug with tile. Capture the tones of your decor and protect your wood flooring from the in and out traffic through the entryway. Do you have an open floor plan with a view to the kitchen? Replicating the tile from the kitchen to the entry gives beautiful balance to your open spaces. You love the look of wood floors without the worry of higher traffic areas. The choice is laminate flooring, but which one? Your first consideration in making the right selection is the floor's rating. Is the floor rated for commercial use? This is a great guideline to go by. Commercially-rated floors are optimum in performance for your home's entryway. 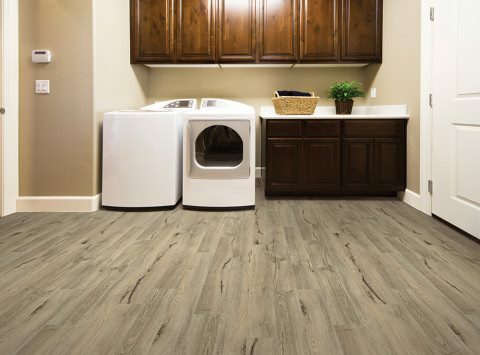 Our pick is Armstrong's Rustics Premium Laminate offering a 50-year residential warranty and a 10-year commercial warranty. A cohesive spirit is happiest when the outdoor flooring carries through to the interior. Curb-appeal to our first impression entryway design is accomplished with tile. We interrupt this Blog to update our post with the latest in bullet-proof floors! Here we are in 2018 and our Vinyl Planking is not what it use to be. The innovation of Vinyl Plank is ever-changing, ever-evolving and now is 100% waterproof! Offered in several wood-look styles that actually look more like a wood floor than vinyl. Easy-care, and worry-free this waterproof vinyl plank floor has taken over our sales of all our wood-look products combined. Masland's Contract Carpeting. Combine with selections of Mohawk's SmartStrand Forever Clean carpets and we're covering the adjoining rooms too - worry-free softness underfoot. We've come full circle and have decided it's time to present some area rug offerings. Presentation is everything after all and we do love our Jaunty Area Rug collections. I think I see a "Perfect Pair" here.. Thank you for joining us in our "Well Lived Home". We'll be following up with a sequel soon. The floors we've featured are of products that we showcase and if you'd like to see the sampling in your own home, please give us a call. We also provide interior design services to assist you in all phases of your entryway project.